Wednesday Watercolour at DVSA – Week Two! 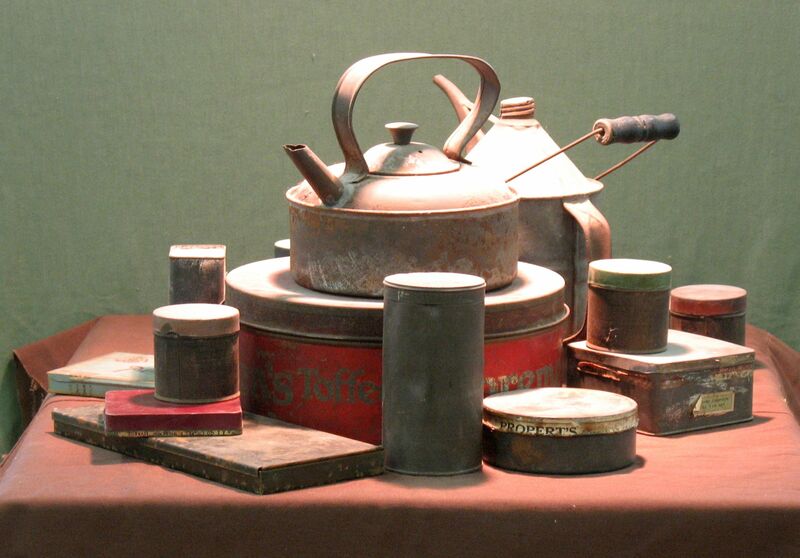 Ceramic objects were our subject at the Dundas Valley School of Art last Wednesday evening. I’d given thought to the work from our first class and decided to focus my demonstration/lesson on two things; mixing middle tones and simplification. 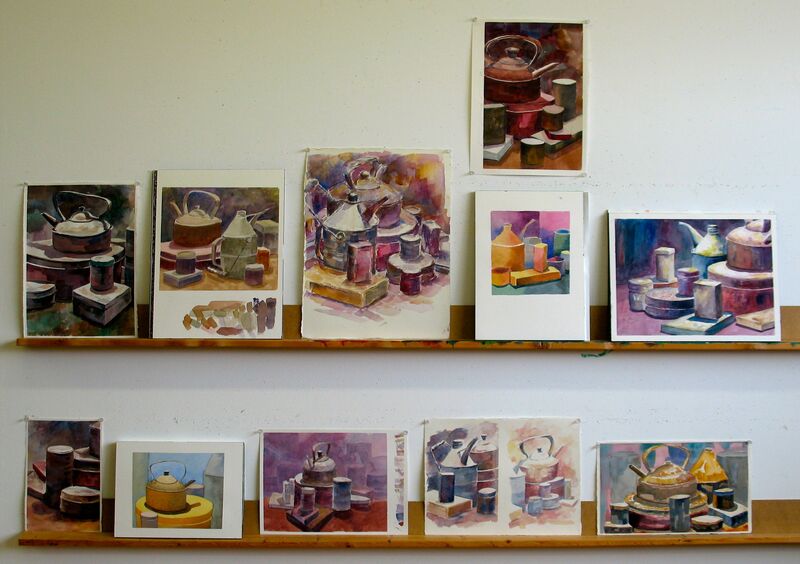 The prerequisite for this class is ‘some prior watercolour experience’. As such, some of the students have a fair bit more experience than others but I have no problem with reviewing a few basics. 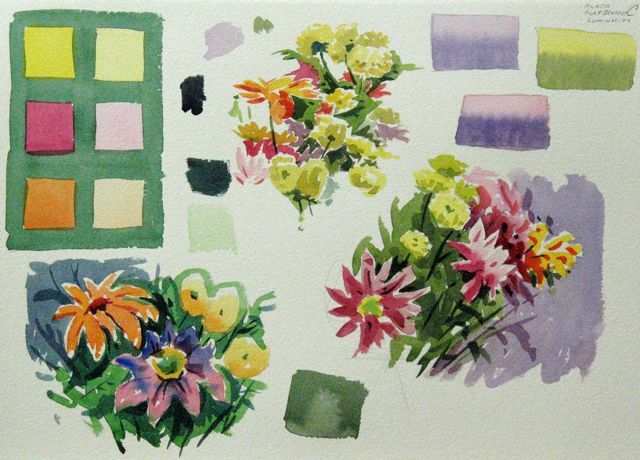 The less-experienced watercolour artist often has trouble with mixing the middle tones and their paintings can look washed out. Starting with primaries, I offered my thoughts. Next we turned our attention to simplification. Simplification of form is not a technique; it’s a concept. It’s very closely allied to chiaroscuro (light and shadow). 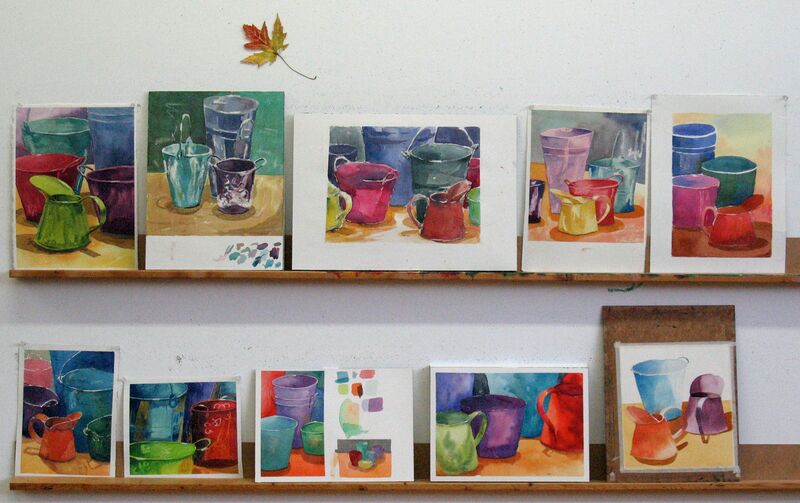 My little studies are painted with a single value mixed from Cobalt Blue and Burnt Sienna. I didn’t paint the areas where I observed direct light striking the objects. Can I get any simpler? 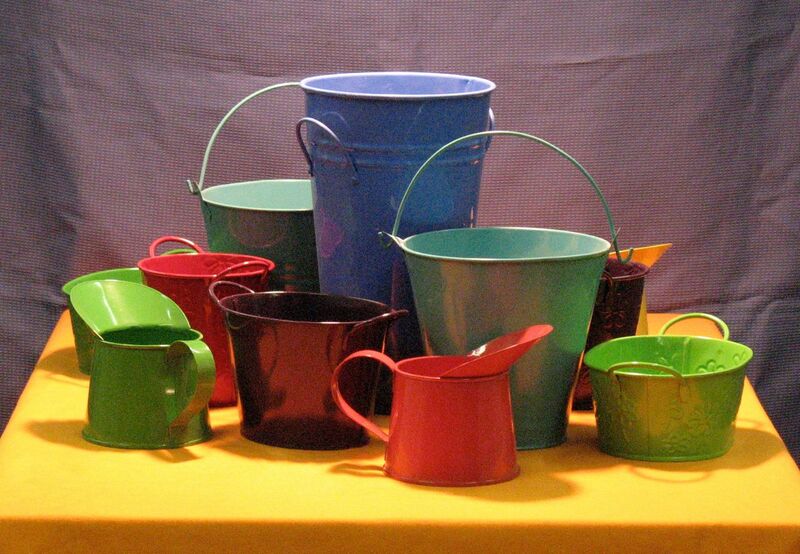 Can you see and understand the basic objects? 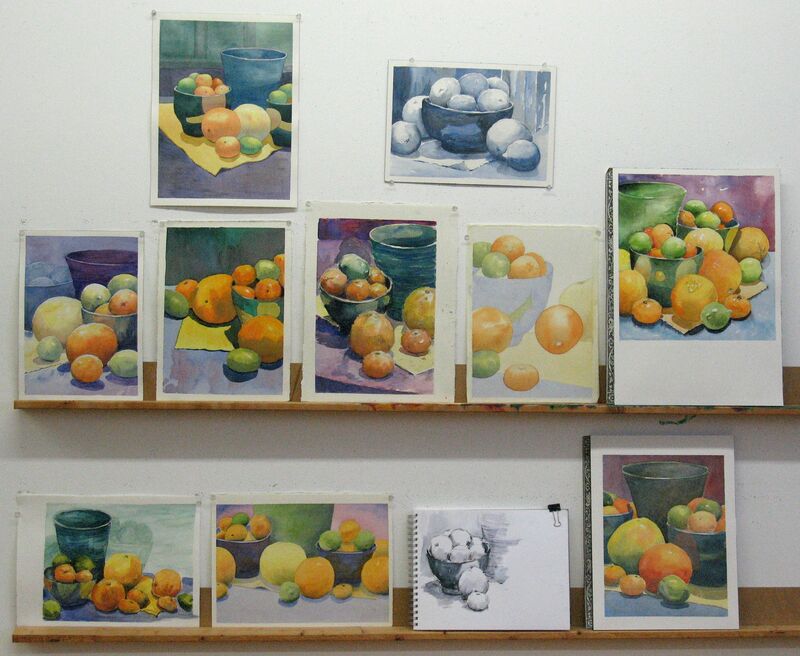 Many of the students spent time on small studies before embarking on a painting. That took time and not many of them were able to finish their work by the end of the evening. It was time well spent, though! Learning can’t be rushed. We’ll see more resolved images over the weeks to follow. I saw a lot of good things on Wednesday evening. 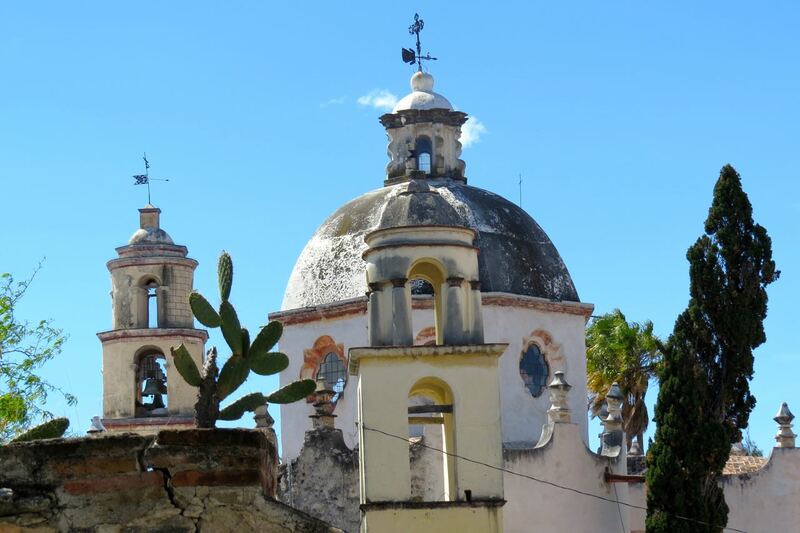 We headed out of town on Wednesday to historic Atotonilco. I knew what was in store and that was lots of domes, towers and belfries. My demonstration had two main themes. First of all, I discussed the basic volumes that make up an architectural form. Can we analyze the tower in terms of spheres, cones, cylinders and cubes? 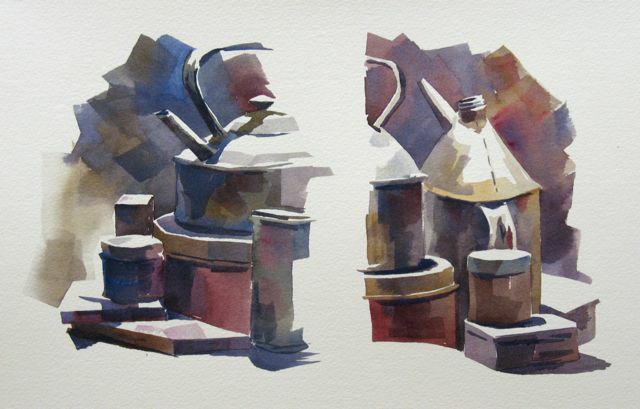 Doing so gives us a greater understanding of the subject and also leads to my second theme; light and shadow. The light changes over the course of the day and, if the sun goes behind a cloud, shadows can’t be seen at all. Understanding the forms we’re painting helps us light the forms effectively. 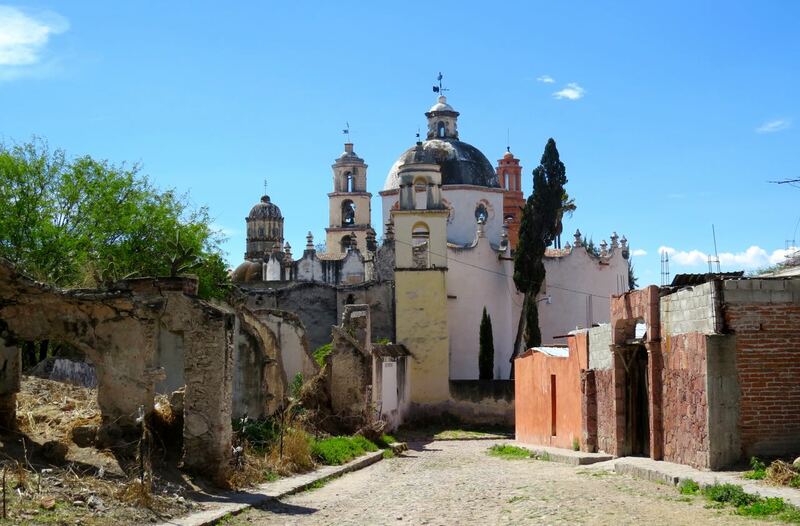 The cathedral and ruins at Atotonilco are quite spectacular. 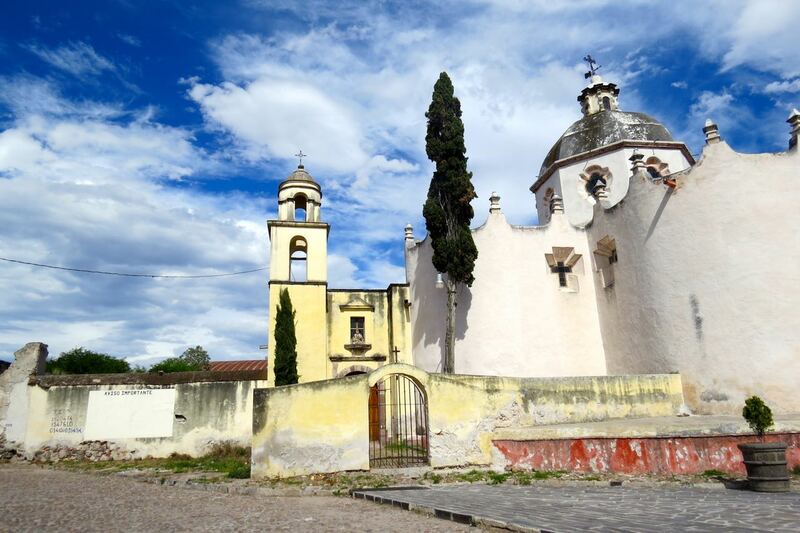 It’s a quiet town and only about twenty minutes away from SM de Allende. We hopped in our taxis and got there in no time. It’s a very popular spot with my students and you can see why. As usual, we gathered back at the studio for our critique. As we wound up our critique, thunder crashed and the skies opened up for about 30 minutes. 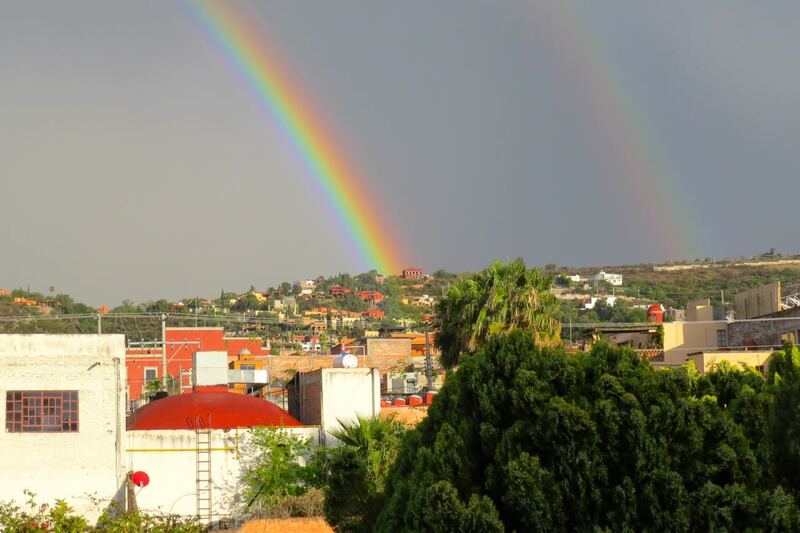 Soon, the sun was back out and we were treated to a fabulous double rainbow. 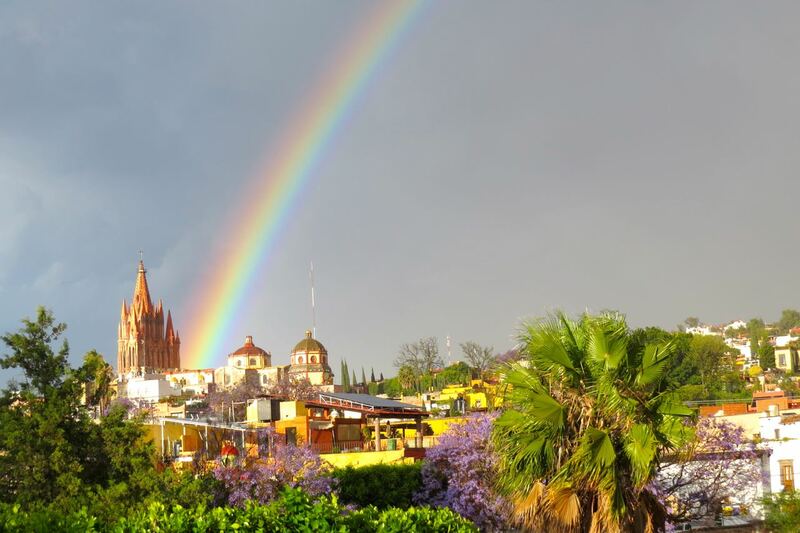 Another great day in San Miguel de Allende. 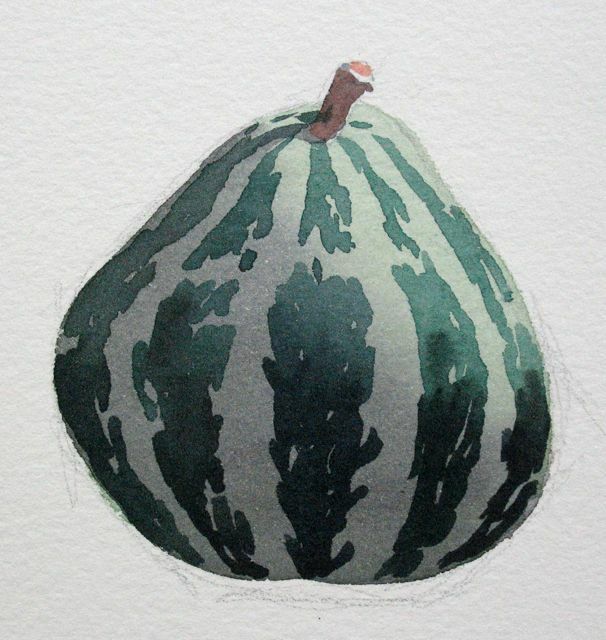 Tuesday Watercolour Class – Week Three! We devoted our first two weeks to light, shadow and value and it was time to add some colour to the mix! Observation of light and shadow is still important, of course. It always is. These objects, however, were lit primarily on the lips and handles, leaving large planes of middle values and some reflected light. My demonstration involved the use of wax to indicate reflected light. Also, I employed soft edge techniques to vary the planes and add visual interest. Someone asked a question about the handles and one of my handles turned into a question mark. Go figure! The results are a lot of fun to see. By the way, our maple leaf is not a strident symbol of Canadian nationalism. It’s more like an autumn weather thermometer. I thought it had entered the studio on the bottom of someone’s boot but later discovered it had dropped out of a sketchbook. While you’re in the neighbourhood, take a look in the sidebar. 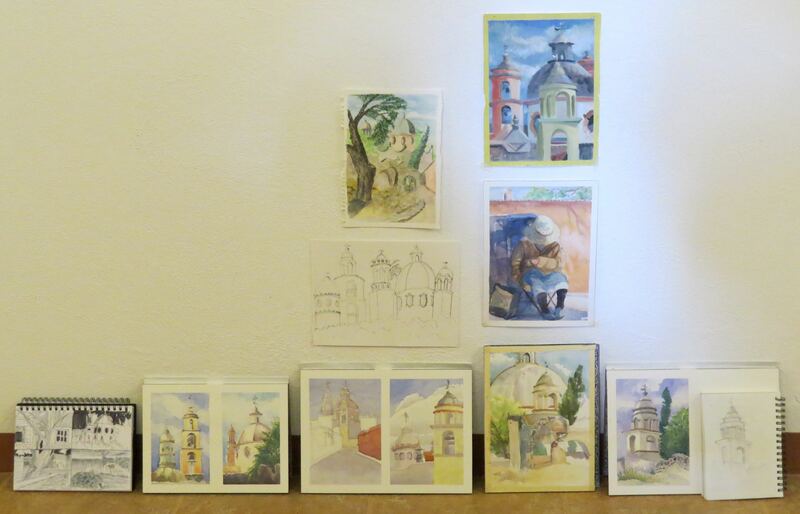 My 2015 painting holidays are posted. Two additional trips are in the works, as well. I’ll be teaching on the Sunshine Coast of British Columbia in late August and plans are underway for a return to Italy next fall. We had another snow storm last night. 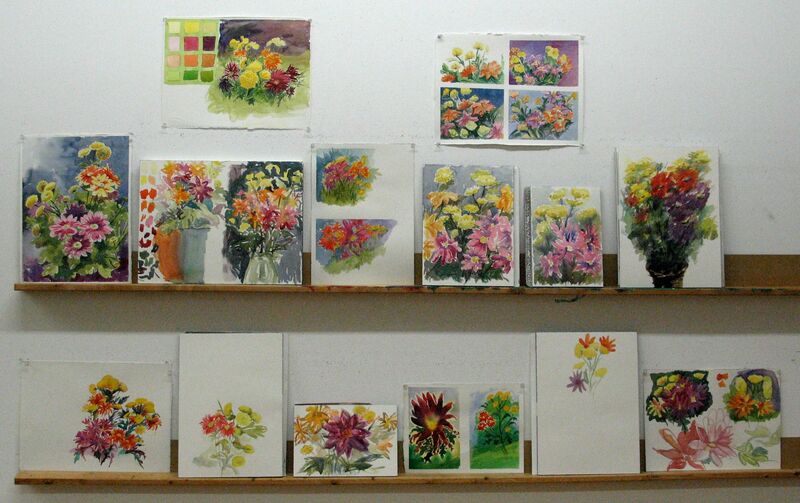 I felt it was time to jump the gun and bring spring into the studio. There were a lot of smiles as the students came in and saw the flowers. There were smiles on the way out, as well, but the intervening three hour classes had definitely witnessed a few sighs and groans. Flowers are hard! They’re beautiful to look at but a real challenge to paint. Especially, when you don’t paint them very often. Painting flowers is difficult because they are so lovely we don’t want to insult them. It’s hard to be objective. 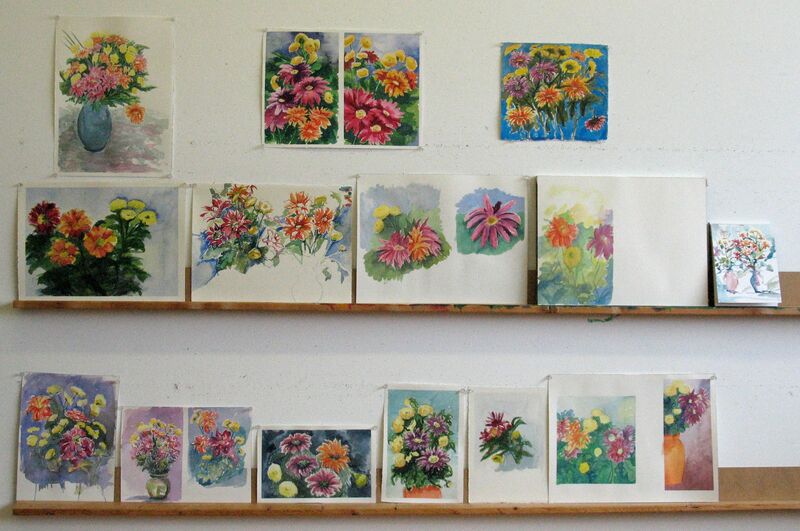 I used my demonstration sheet to talk about a few things that relate to floral painting. 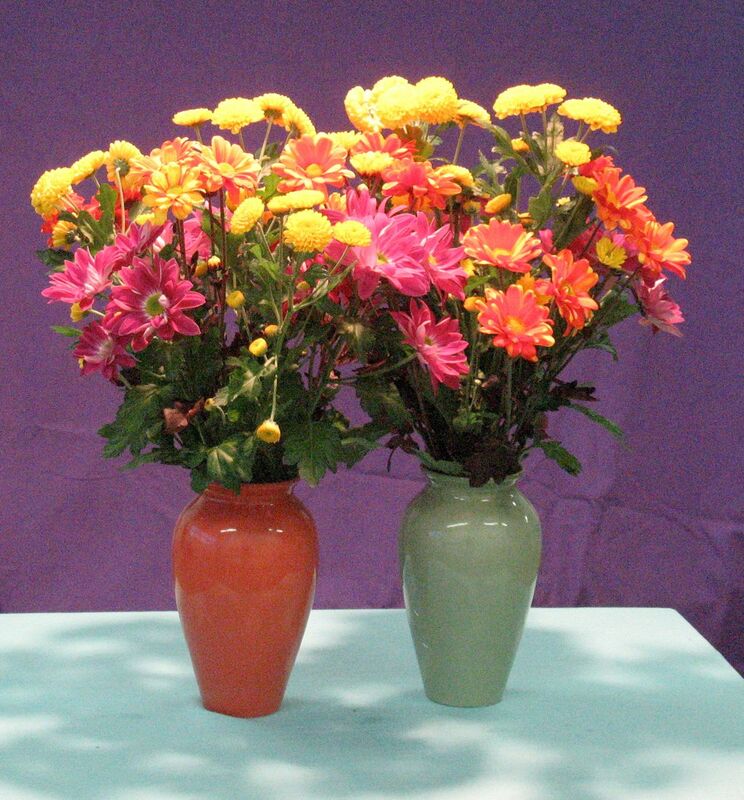 Colour intensity versus luminosity. The supporting role of green foliage. Use of paper white. Brushwork. To draw or not to draw. 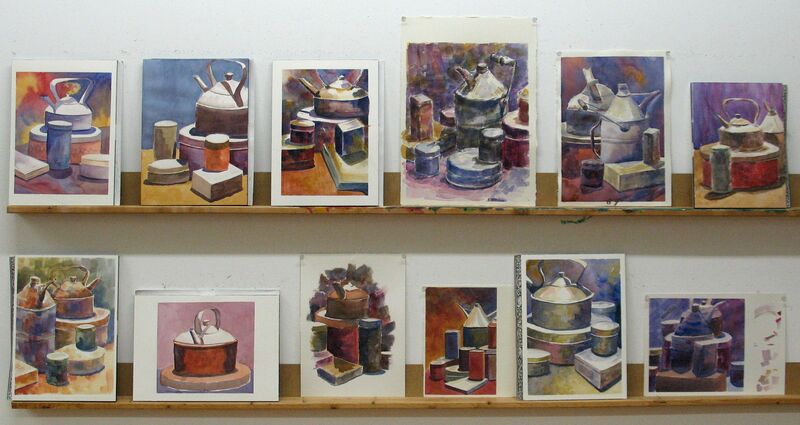 Mostly, I suggested that the students think of their work as watercolour sketching and focus on process over product. Well! 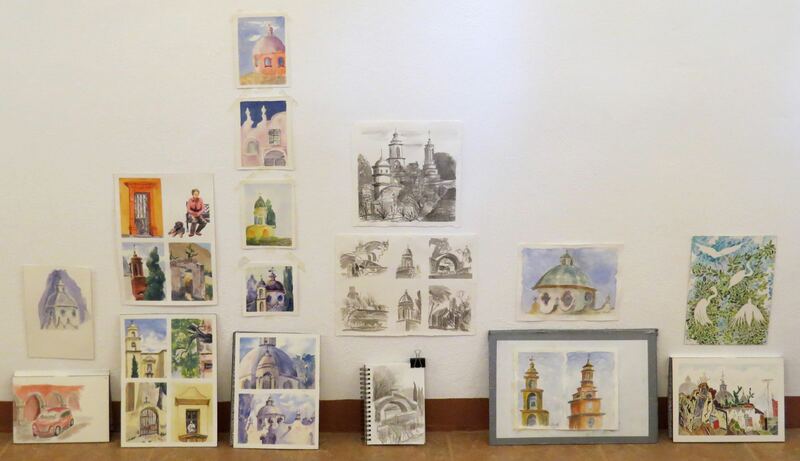 Some of them did three of even four small works and gained a lot of valuable experience. Many struggled but enjoyed themselves and could see the potential in their efforts. I used to follow up a night of floral painting with a still life of old shoes. The shoe paintings were always wonderful. It was a relief, after the flowers, to paint something seemingly banal. I don’t know yet if I’ll set up shoes for next week and I wouldn’t give it away even if I did. Come to think of it, sandals might be a better hint that we’re ready for spring. 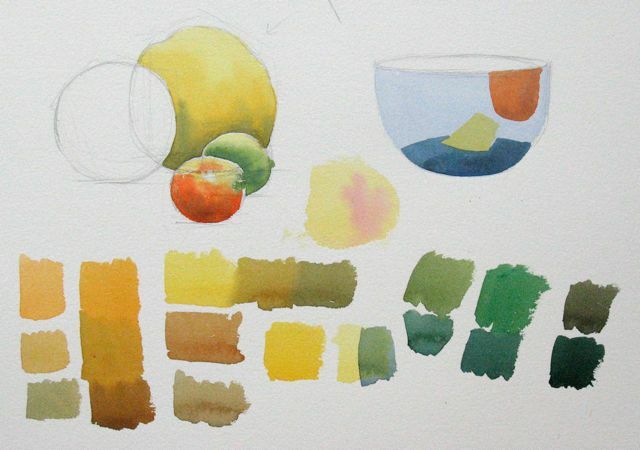 Sustained Saturday Watercolour Class- Citrus! Sangria, anyone? 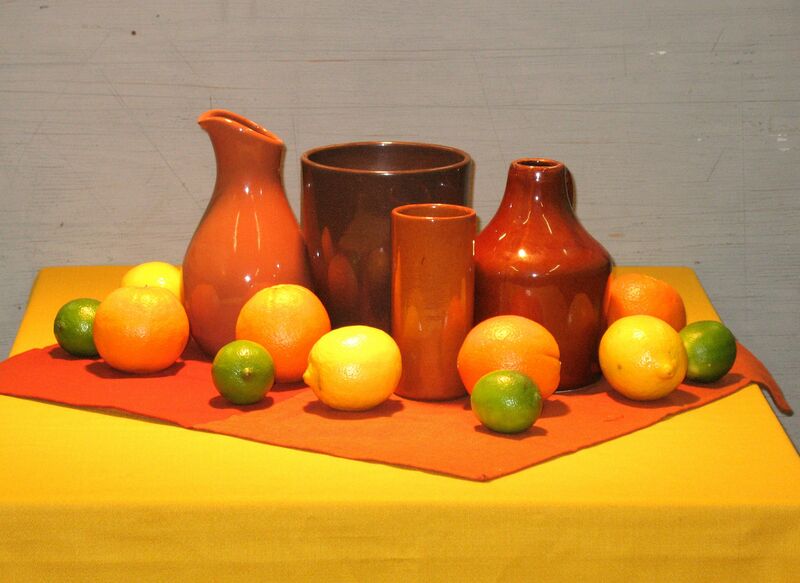 I was just about to start my demonstration this morning when one of the students suggested that we could convert the still life into a sizable vessel of sangria. Artists! I wanted to talk about three main things; ‘wire frame’ drawing, mixing different values of warm colours and reflections. Sometimes, I communicate my thoughts in a more complete image and other times I get the ideas across with a work sheet like this. It’s not a very glamorous demonstration but it seemed to have the desired effect. After the demo, everyone rolled up their sleeves and got to the task at hand but I wasn’t finished with them yet. I waited 45 minutes or so and called the group together. We walked around the studio and looked at everyone’s thumbnail sketches. 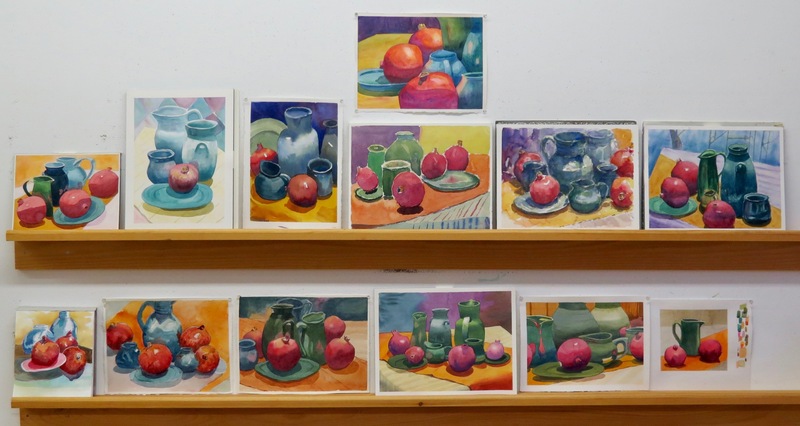 I notice that the students who work out their compositions and their ideas at the thumbnail stage are often quite successful with their paintings. Anyway, here’s the work from today. They definitely earned their sangria. 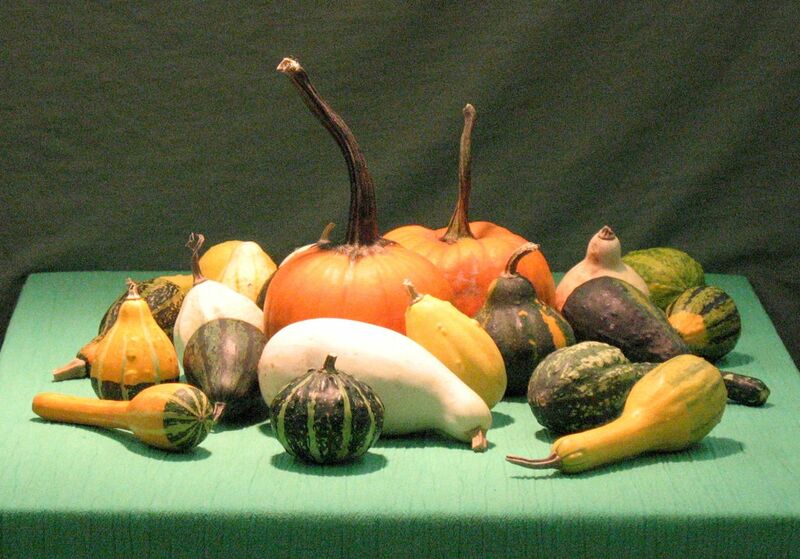 Sustained Saturday – Gourds and Pumpkins! 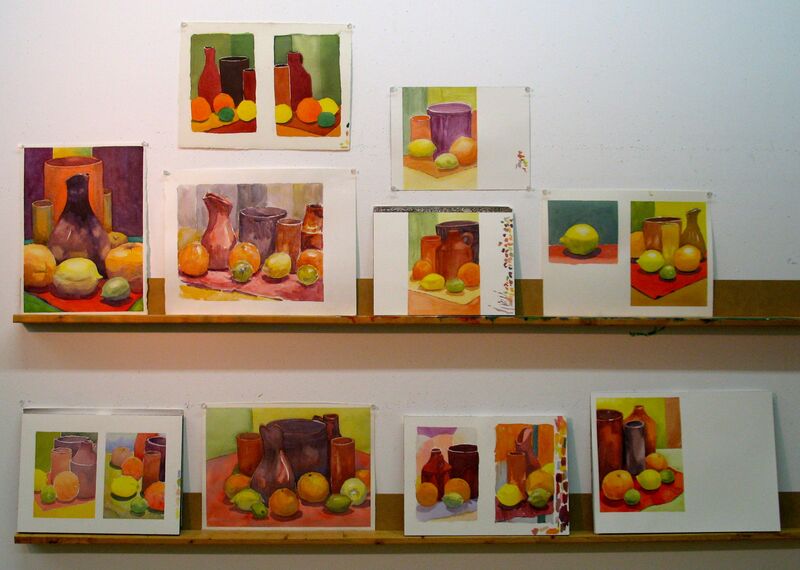 I couldn’t deny the Saturday students the pleasure of painting a traditional autumn subject so I reorganized the still life from last Tuesday’s classes. My demonstration was similar to those from Tuesday, as well. 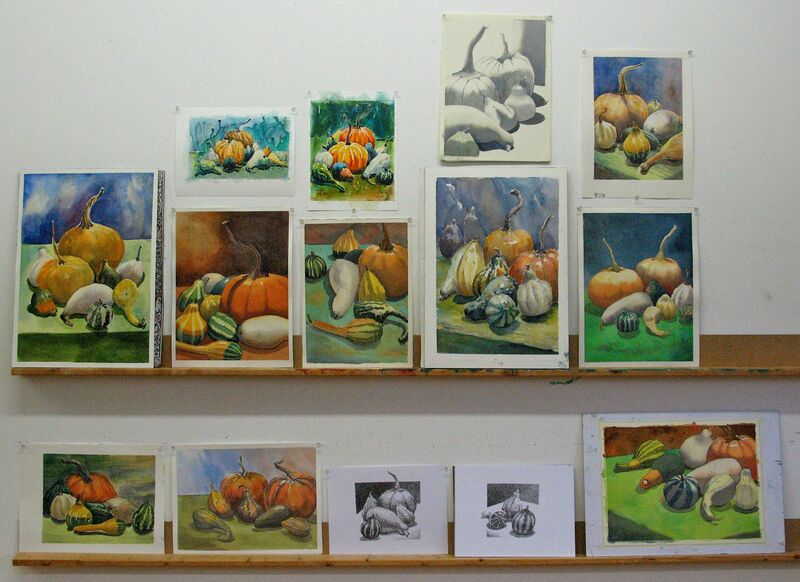 The core and cast shadows of the gourds were painted with grey. Paper white was left untouched for the lightest areas. Once dry, I added local colour. First, the lightest colour and then the darker stripes. This was the first Sustained Saturday class of the Fall term. Many of the regulars were back. Everyone was happy to see their painting pals and, as always, were very welcoming to the new folks. A nice culture has evolved at the studio over the years. We work hard, support each other and have a lot of fun. The work was terrific. Here it is! Tuesday Watercolour Class – Week Eight – Rust and Dust! Not all of the students adhered to all of the four elements. Most did some pencil drawing, for instance. I think everyone used some form of a triad and you can see how it helps to harmonize the colours in a painting. Sustained Saturday – Brass, Kiwis and More! Yesterday, it was a full house at my studio for our first Sustained Saturday class of 2013. 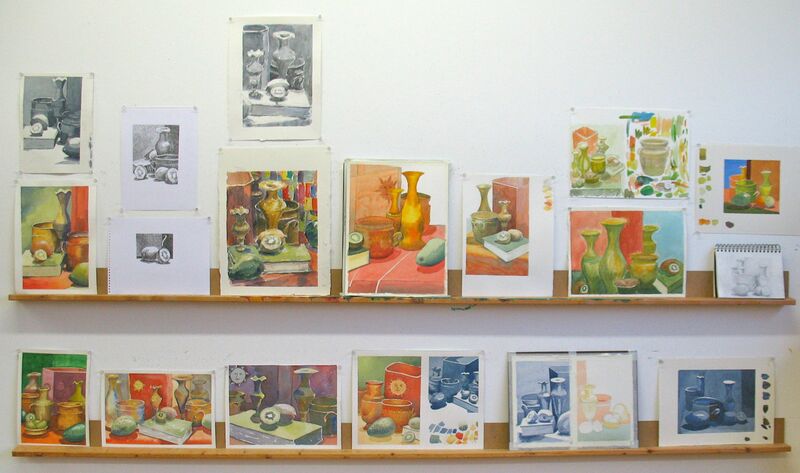 Last Tuesday, I inflicted a still-life of old shoes and boots on the classes. The subject matter may have been prosaic, to say the least, but there were some lovely results. 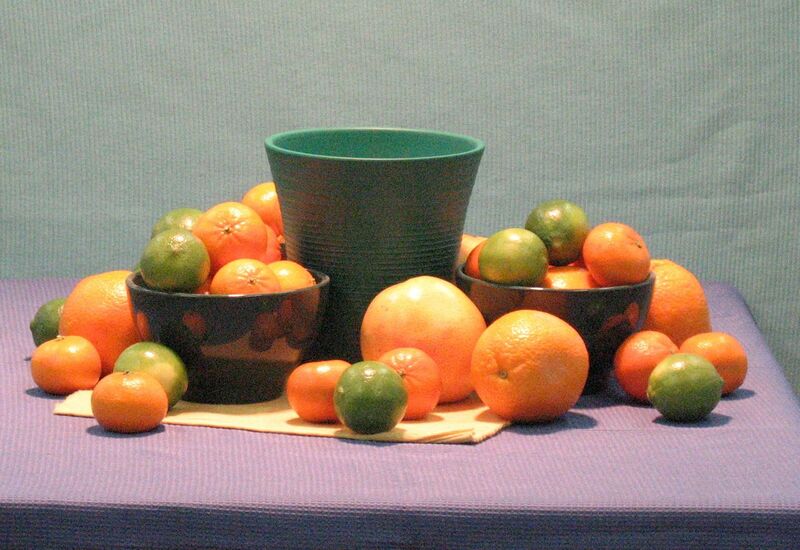 I tried to make our new still-life attractive in a more traditional fashion. It was complex with a lot of elements so the students were compelled to select an interesting area and create a composition. 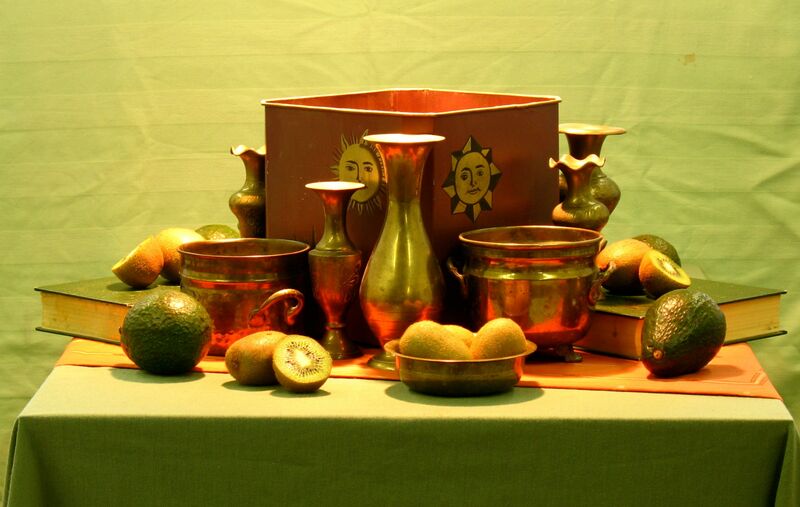 Our still-life was lit by a lamp which hangs above it. It illuminates our subject quite well but it doesn’t benefit from the overhead fluorescent lights and even the north light from the window. I wanted to discuss value and the importance of a single light source. So, I painted my demonstration in the dark. As a rule, I don’t recommend painting in the dark but it allowed us all to see and record the most important areas of light. 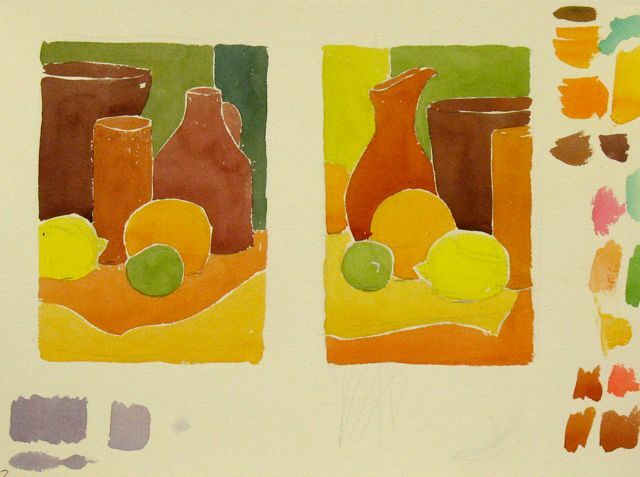 My demonstration was done in four values. 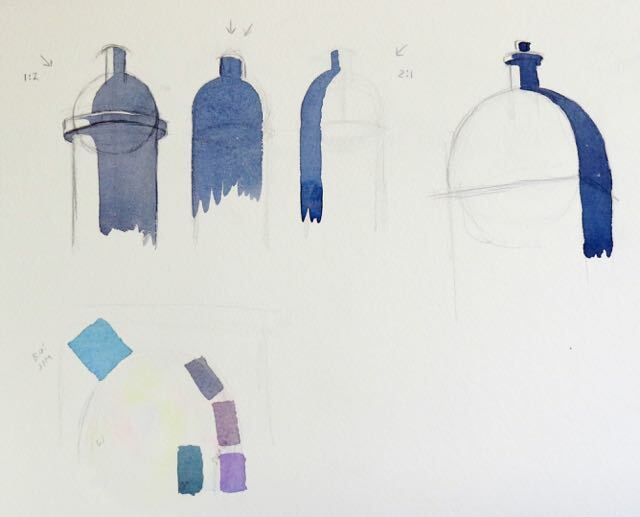 My blue/grey washes were mixed from Cobalt Blue and Raw Sienna. I wasn’t concerned about neatness or subtle soft-edge transitions. This is very much a working study. 1) Paper-white was reserved for the strongest light. 2) My first wash was a middle value and it was painted everywhere except for the lightest areas. The study looked very flat at that point but the light had been revealed. 3) The second wash was a darker middle value and it added structure and definition. 4)The final wash was very dark. During the class, I frequently turned off the fluorescent lights for a few minutes at a time. I adjusted the window blinds to minimize the impact of exterior light. 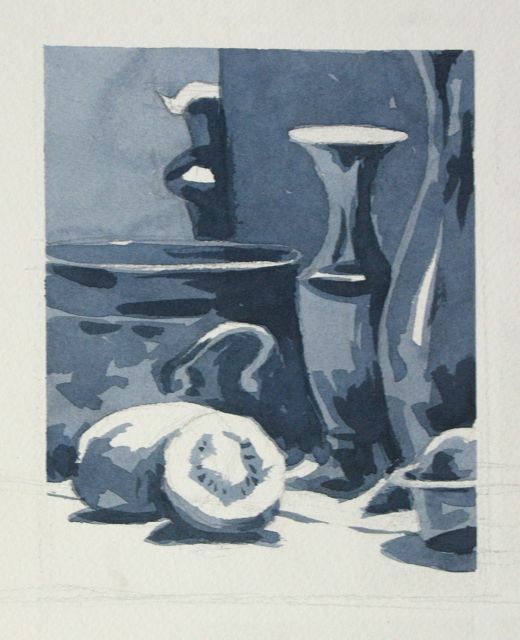 Most of the students tried a value study before embarking on a more sustained watercolour. The beauty of a 7 1/2 hour class is the extra time and I was pleased to see much of that time devoted to a sound process involving sketches, studies and colour testing. We included our value studies in our Critique because we wanted to share them as well as the sustained work. Happy New Year, art lovers! 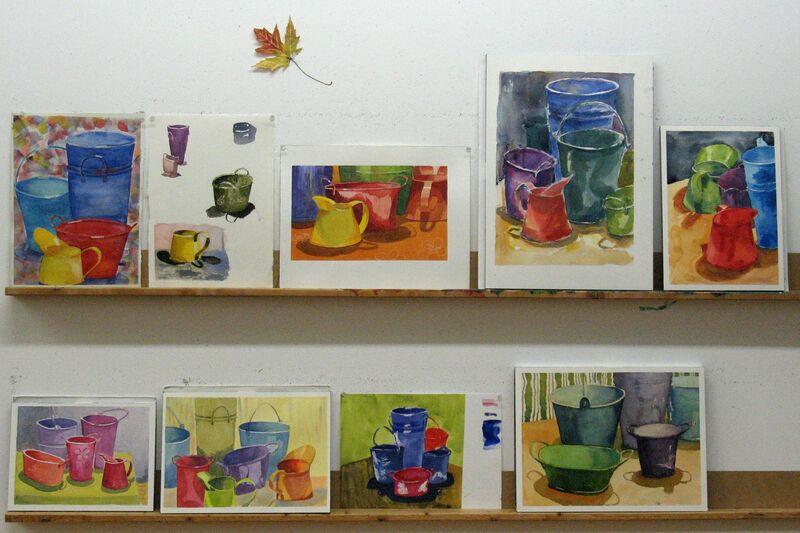 It was time to get back to watercolour painting at my studio yesterday. 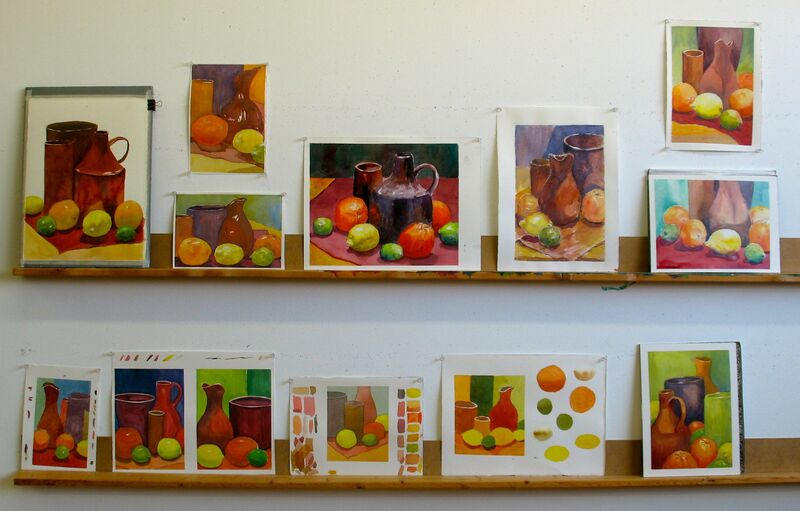 I like to start each term with some colour and some familiar yet pleasing shapes and the citrus fruit seemed to fit the bill. I used my demonstrations, almost like diagrams on a blackboard, to illustrate the fundamentals that I discussed at the start of each class. 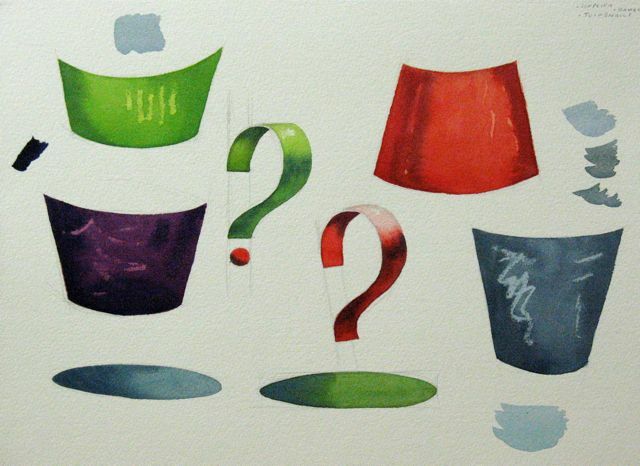 Simplification, value and colour were my main topics. I did these little watercolours with my primaries only; Aureolin (Mixture), Rose Madder Quinacridone and Cobalt Blue, all from the Da Vinci Paint Company. 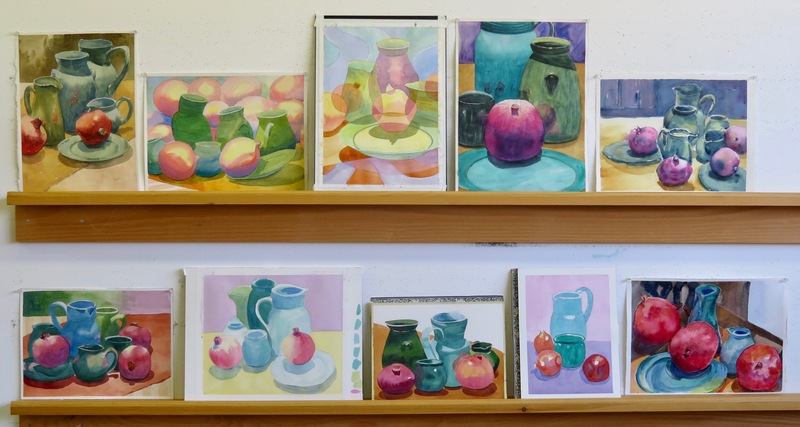 Some of the students are still fairly new to watercolour and I asked them to keep their paintings as simple as my demonstrations. As it happened, a few of the more experienced artists liked the idea and tried it, as well. The rest went ahead and did their thing and we had some very colourful and cheerful results. It looks like we have a creative winter term ahead of us. Thanks for following.